Clerks is one of those iconic cult films that stays with you for decades after you've feasted your eyes on it. I was in my mid teens when a friend recommended I watch this low budget, black and white film. It came out in 1994 and I didn't see it until it came out on VHS a couple years later, so I was probably around 15 when I saw it for the first time. I remember not really getting all that into it at that time. It wasn't until a few years later after I taken on a few minimum wage jobs at a pizza place (my first job paid $3.75 per hour) and later as a motel front desk clerk that I saw it again and really started to appreciate the nuance as well as intent of the message. It's a movie with great writing and vibrant characters. It captures what life is like for young people trying to make sense of and navigate through a confusing, chaotic world. Kevin Smith had a very clear vision for what he wanted to make, and gambled a lot to make it happen. I've always liked Kevin Smith's movies, even the ones that weren't that great overall. His writing style is unique, and combined with the casting choices in his early films, really brings out interesting subtleties in the characters he creates. I think a lot of people took notice and my opinion is that Smith drank a little too much of the Kool-Aid... believing too much of his own press and subscribed to the praise and ideas of his own genius. I think that's why some of his later films didn't work quite as well. He got really preachy...not just in his movies, but also in his public appearances. I remember watching one of his talks and he started it off with something along the lines of "The fact that I have a movie career is proof of the existence of God." I'm paraphrasing, but I'm pretty sure you can find a quote from him that's pretty damn close. Yep, I just Googled it and I was pretty damn close. I found it on his Wikipedia page: "Smith told the BBC that he firmly professes a belief in God. He said, "Proof of God is that I have a career." Hearing him say that really turned me off, not because I'm an atheist. I'm agnostic, but that's kind of the point. I don't believe or disbelieve anything that I can't prove, and I'm therefore always open to new ideas. However, I can't stand when people attribute their success to God, because that's setting a dangerous precedent. That means that God chose you to be successful, and chose other people to be poor, suffer, contract disease, be abused, raped, killed, etc. I think you get the point. It's logic that hearkens back to when kings were put in power because of divine right. Regardless, that doesn't mean that I can't appreciate the man's work and I do. He's a talented writer, and I've always really enjoyed his films. 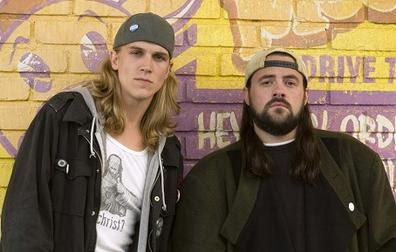 Two of the most interesting characters that he's created were Jay and Silent Bob, who have turned into icons in their own right. Starting off as comical drug dealers in Clerks, they have gone on to have shows, cartoons, comics, and a feature film based on them. What I didn't know was some of the history that not only created them, but almost prevented them from becoming anything of the sort. Looper dives into the controversy and triumph that became Jay and Silent Bob. Take a look.